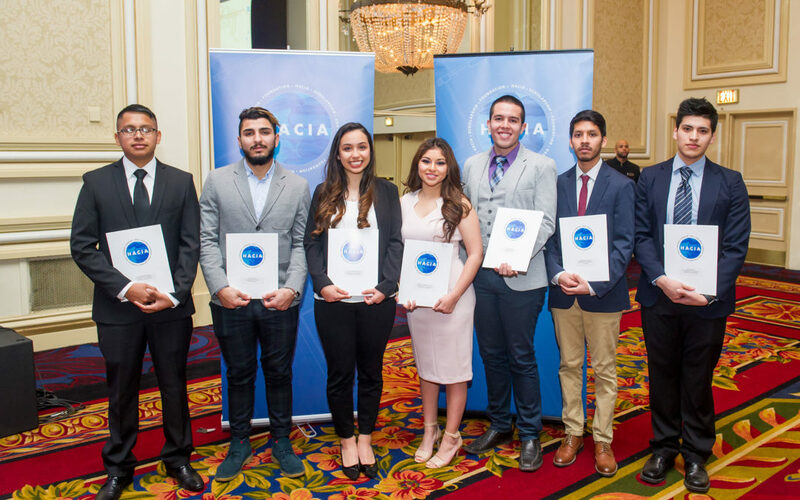 Every year HACIA Scholarship & Education Foundation (HACIASEF) awards up to $35,000 in scholarships to deserving students studying in the construction field. This year HACIASEF will reward $40,000 to eight college students. The scholarships will be presented to students at the 38th Annual Awards Banquet featuring Invited Keynote Speaker Governor Bruce Rauner on Wednesday, March 15, 2017 at the Chicago Hilton & Towers. Adalberto De Jesus has always known that architecture is an option when thinking about a career, he wanted to design a building one day and have someone look and admire it, just like he does now. Adalberto comes from a Mexican household and little did he know that his grandfather built their house in Guerrero, Mexico. His grandfather did not have an education but he had the love and desire to build a house so his children will have a roof over their heads. “My grandfather is my inspiration as I pursue my career in architecture,” said Dejesus. Adalberto has faced many obstacles, he is a first generation college student, “graduating from high school was a big accomplishment for my family,” said Adalberto. One of the major obstacles he is facing is paying for college, “pursuing an education is costly”, his parents try to help but it’s been difficult since his father is unemployed and his mother works a factory job. These are struggles that have put a strain on his college education but it has also intensified his passion for a career in architecture. Ashley Tovar – De Leon interest in architecture sparked junior year in high school, she felt in love with physics, this passion led her to join clubs and create projects. She joined Build On, an organization which constructs schools and homes in poverty stricken countries. Her experiences and interests drove her to apply to the University of Illinois at Urbana-Champaign to pursue a degree in architecture. The week she received her award letter congratulating her for her scholarship, she also discovered she was pregnant. Determined to not become another statistic she decided to go to Urbana-Champaign; pregnant and alone. Ashley became a mother on February 23rd of that year by giving birth to a beautiful son she named Noah, Ashley never consider her son an obstacle, much less that “he ruined her life”. On July 21st Noah was pronounced brain dead and had to be disconnected from life support. “At the age of 19, I am able to say I have the best and worst days of my life, both given to me by the same person,” said Ashley. Juan Azuero graduated from high school in Colombia where he was steered towards Biomedical engineering with the mentality of it being a profitable major. His interest in architecture started at a young age when he would see his granduncle come home with floorplans from his graduate students. Progressively Juan understood how architecture is a vital aspect in everybody’s existence. Having graduated from a bilingual high school in Colombia, Juan thought his English level was in a good point to study architecture in the United States, he discovered that a conversation with an English native speaker requires a higher speaking level. He moved to Hollywood Florida in late 2011 and started an associate in arts degree in at the local community college, he struggled at the beginning with subjects, socializing and the culture. Transferring to the Illinois Institute of Technology has become a huge accomplishment for him and for everyone who’s been there to support him. Juan truly enjoys the design process; “even if I’ve slept a few hours before a presentation, when I see all my work pinned up on the wall, there is no better feeling that that, It just doesn’t have a price seeing how my hard work came to life,’ said Juan. The process of drafting the designs with a team of engineers, discussing the benefits of the design, being present during the construction phase, and calculating costs for a project, is a career that has boosted Ivan’s motivation in not just getting good grades but being active in activities in school hosted by groups like the American Society of Civil Engineers. When Ivan Chavez’s dad first arrived to the United States, he was given the opportunity to work in the construction industry and has worked for the same company for 25 years, his father’s efforts has led him to work from a laborer to a superintendent position. His father’s continuous success at his company has resulted in a close relations with the owners and allowed Ivan to work summers. Ivan has become more financially responsible and the money he has earned has gone directly to cover school related expenses. Luis arrived in the United States at the age of four along with his parents who always encourage him and emphasize in him that the path for success is education. Luis Chavez’s father wanted him to become an architect, but as he grew up he knew he would rather be on the engineering side when it comes to designing structures. During his last year of high school he realized that his legal status would prevent him from receiving financial aid, and essentially bar the progress of his education. Luis’s academic accomplishments have allowed him to become a candidate to receive scholarships, but his legal status will not allow him to accept them. Throughout his time at the University of Illinois he sought out academic internship experiences, applying for teaching and research positions and has become a volunteer. “My experiences inspire me to pursue a career in Civil and Environmental Engineering”. Katherine Marie Bohorquez interest in civil engineering emerged from her exploration of Urban Planning, she found herself becoming passionate about learning how the physical environment of a city affects the people within. Katherine attends the Civil Engineering program at the University of Illinois at Urbana Champaign, before declaring her major Katherine participated in a winter break study abroad trip to Cape Town, South Africa. Katherine has also joined the Society for Women Engineers’ (SWE) Outreach Committee. Through this committee she works with kids between Kindergarten and 12th grade to spark their interest in engineering and ensure them they are bright, creative, and hardworking enough to pursue STEM fields. Katherine’s experience at the University of Illinois has shown her the potential and hope for the future with regards to women and minorities in STEM and the social and environmental concision innovation with Civil and Environmental Engineering. “I always told my mother that one day I would build a beautiful home where she and I could live” said Donovan. Architecture is a career that will allow Donovan to not only implement his creative hands but also provide the opportunity to physically structure and change the nature of the city impacting both the social and cultural aspects of urban living. Donovan born in Mexico moved to Chicago with his mother at the age of six, he feels fortunate enough to attend Walter Payton College Prep. Donovan is currently enrolled at the Bachelor of Science in Architecture Program at UIC. “My parents are my biggest inspiration”. Julia Mosqueda’s father grew up on his own in Chicago after migrating at the age of 12, her mother move here once she got married, both parents made a sacrifice to leave Mexico. “I want to make their sacrifice worth it,” said Julia. Julia is interested in architecture, “Architecture is the only thing that has defined who I am, because with architecture I am a designer, a maker, a photographer, an artist, a revolutionary, a believer, a walking testament of everyone that has come before me, including all that inspire me,” said Julia.